Inside, the boat harbors a master suite with two bathrooms (each with cast iron spas) twin walk-in-closets and a private study. Other rooms include a VIP guest stateroom and three additional guest staterooms. Shortly after Brandes came on board, he knew he wanted a state-of-the-art, custom, high-resolution and mobile-centered video surveillance system for the ship to replace the "very basic" and "old technology" previously used. The Captain researched and decided on Odin Systems, Inc. a cutting edge video surveillance company out of San Diego that designs and builds custom security solutions using state-of-the-art technology including Mobotix cameras. One single Mobotix camera delivers a 5 megapixel image and records about 10 times more detail than a standard security camera and allows larger areas to be recorded. "The biggest focus when running a superyacht is safety for the passengers and crew," says Brandes, "and this surveillance system is a big part of the control and security onboard." In fact, he says, "it has proven essential for the safe running of the ship." While not common, there’s a lot that can happen while at sea or even docked -- from pirate attacks to harbor accidents, to theft or vandalism. The Glaze’s new system is outfitted with remote TCIP (Transmission Control Internet Protocol), and indoor and outdoor camera sites which allows the crew to effectively monitor threats in real time and also gives them the ability to communicate to emergency responders in seconds if needed. The system also allows for two weeks of footage storage, allowing the team to review images if necessary and also to review best practices on board for safety and service. Stellar, efficient guest service is right under safety, in fact, in terms of importance for any superyacht. 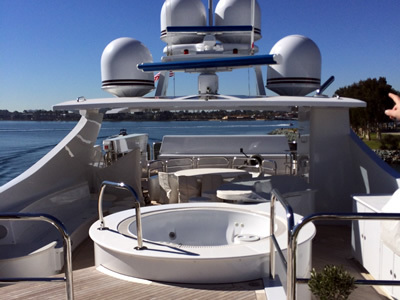 On The Glaze, there are 22 fixed Mobotix cameras and three high-resolution pan-tilt zoom cameras, all of which relay real time video to a recording server via the Milestone Professional platform, and also to onboard iPads used by the crew to serve guests aboard the boat. Whether a guest needs a beverage, a band-aid or a burrito, the crew can find them instantly via iPad and deliver the necessary items or assistance with drastically reduced wait time. "It is very important that you know what is happening on and around the ship," says the Captain. "Whether it is for guest service, ship security or dealing with an onboard emergency, it is an essential tool to have onboard." "We wanted Captain Brandes and his team to have the ultimate control over their vessel,” said Odin’s CEO Dustin Saylor, “We wanted to give them the leverage they needed to be proactive and responsive in every area necessary." Two months after The Glaze received her shiny new security outfit, the Captain tells us that it is "working perfectly and as designed. The team at Odin met our expectations and delivered a state-of-the art system." Want to take a peek inside The Glaze? Take a virtual tour through photos, courtesy of Superyacht Times.